PERCHANCE TO DREAME… OF SUMMERTIME! Susie Napper is one of the two viola da gamba players (the other being Margaret Little) who form Les Voix humaines, the distinguished guests of Camerata Nova for the upcoming concert Perchance to Dreame… The concert, also featuring renowned tenor Charles Daniels and lutenist Sylvain Bergeron, will take place on Tuesday, February 4, 2014 at 8:00 pm at Crescent Fort Rouge United Church. See links below to hear music by these excellent musicians. In her blog, Susie Napper explains briefly the evolution of song-writing (not so very different from today!) and perhaps also the origin of the name chosen by the duo of gambists (“Les Voix humaines” is French for “Human Voices”). Summertime, and the livin’ is easy…. We’re all wishing for a little easy living as we suffer the biting cold of this winter in Canada and particularly, I gather, in Winnipeg! I’m looking forward to my first visit to the city that is renowned for its cultural life as well as its spectacular natural setting. Before the late 20th century, music-making was the most popular form of home entertainment. Poems and tales were, more often than not, set to music, just as they are today, and sung on a cold evening around the fire. Popular tunes, as in the 21st century, were often originally songs that were arranged as purely instrumental pieces to be repeated and transformed over centuries. Today’s equivalent could be a jazz standard like Autumn Leaves (originally Les feuilles mortes, melody written in 1945 by Joseph Kosma, with the words of French poet Jacques Prévert) that is covered by any number of groups and reinvented in as many ways! Entertainment for the entire family might take the form of songs sung in several parts or a single voice accompanied by one or more instruments “in consort” or simply played on instruments. In the 18th century, Jean-Jacques Rousseau considered that the viol was the instrument that most closely imitated the human voice. 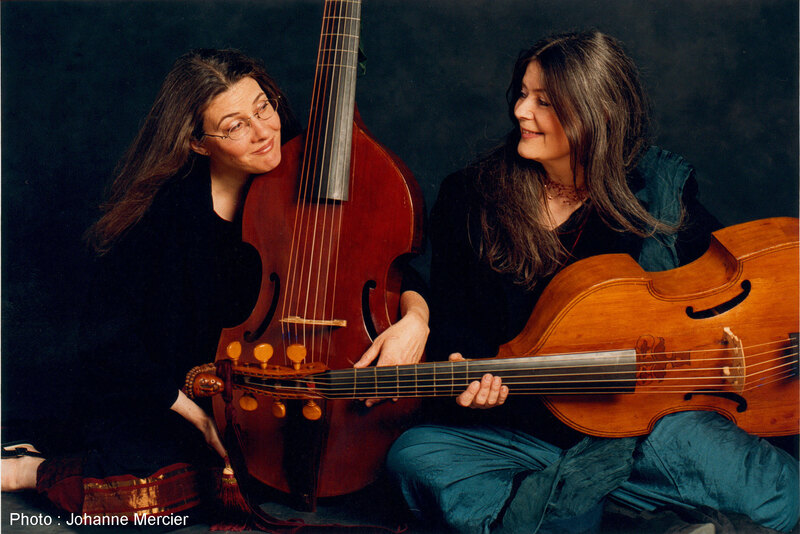 It is hardly surprising that so many of the greatest composers from the early Renaissance to the late Baroque wrote songs to be accompanied by viols. Poetry set to music was the rap of the day and poets advertised their latest creations that could be heard sung to music written by popular composers. Love was THE subject! Isn’t it always? Nature and the seasons were the most common metaphor for the springtime blooming of nascent love and the withering of autumn leaves and barren cold of winter for the desperation of lost love! Summertime embodies the fullness of love! For two centuries the bowed lute was all the rage throughout Europe. From middle-eastern roots, the vihuela del arco, as the Spanish called it, arrived from North Africa in the late 15th century. Europe embraced the new bowed instrument. Brilliant Italian luthiers quickly adapted it to create a useful European-style instrument playable by lutenists and guitarists alike. The viol could be considered an enhanced version of the most popular plucked instruments. Fretted and with similar tunings, this newfangled instrument enabled easy access to chords, but had the added advantage of the option to sustain a melody using a bow. Composers often made several arrangements of their songs for different instrumentations. The practice of rearranging either traditional melodies or popular songs for whichever instruments were at hand was part of any good composer’s life. Exotic examples of arrangements include Mozart’s own arrangement of his operas for wind band or Corrette’s arrangement of Vivaldi’s Primavera for vocal soloists, choir and orchestra. Susie Napper was born in Britain and has travelled the world as a vagabond musician lugging her viol around since the 1960s! She calls Montreal home and enjoys coming back to her kitchen where she is as experimental with flavors as she is with musical ideas! She cooked up the Montreal Baroque Festival a decade ago and encourages her students at the Copenhagen Royal Conservatory, McGill and the University of Montreal to get creative…. http://cameratanova.com/16/wp-content/uploads/2019/01/camerata-logo-use.png 0 0 Karine Beaudette http://cameratanova.com/16/wp-content/uploads/2019/01/camerata-logo-use.png Karine Beaudette2014-01-13 01:39:552016-10-20 12:53:49PERCHANCE TO DREAME… OF SUMMERTIME!